After having done 3 bosses from the SoulsBorne series and with all 3 coming from the latest instalment that is Dark Souls 3, I decided to venture into the Borne section of the series so to speak, I felt I should discuss a boss from a different instalment of the franchise, and the best way to ensure I talk about a boss with different mechanics was to jump into Yharnam and discuss my favourite boss from Bloodborne. Lady Maria of The Astral Clocktower.There are many reasons as to why she takes the top spot for my favourite boss from Bloodborne, from her intricate lore to her insane boss fight. As always I will discuss her lore before the mechanics of the boss fight itself. “She frowned upon blood blades, despite being a distant relative of the queen” the Rakuyo. 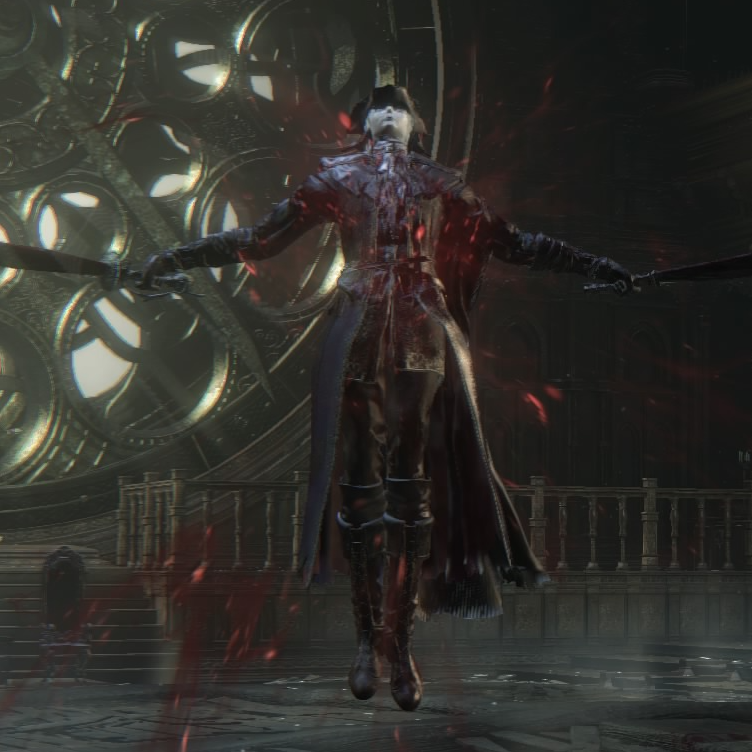 The fact that Maria is from Cainhurst should be reason alone for her to be a fan of blood blades, she would have been raised around them after all. The fact that she is related to the queen should ensure her use of blood blades for a true vile blood should relish in the blood arts. Cainhurst was renowned for its use of blood, so what was it exactly that made Maria despise it? Could it be she didn’t like how blood blades fed on the very essence of its wielder? Perhaps she wasn’t proud of her heritage, something I believe must have had some factor in her decision as she certainly isn’t embracing it. Could it be that she felt there was no honour in the use of blood arts? Or maybe there are some deeper unknown reasons for her avoidance of blood blades. 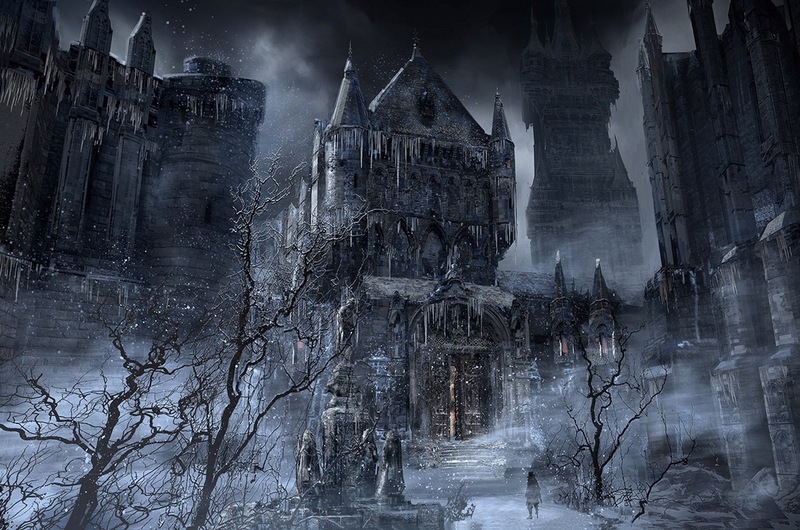 She would have been surrounded by blood blades, the queen, the Nobles and the people of Cainhurst all relished in their extravagant use of blood. I imagine Lady Maria would have felt very out of place, she clearly didn’t resemble any of what Cainhurst stood for so she jumped at the chance to leave the land of Cainhurst behind to go and serve as a hunter under Gehrman who she greatly admired. I think it would be worth mentioning how much the healing church despises the vile bloods so that would mean that Maria had already joined the ranks of hunters for she wouldn’t have been at all welcome and would have surely become a target especially since she didn’t just come from Cainhurst but she was related to its queen. Logarius led an attack on Cainhurst castle which resulted in the genocide of the vile bloods except for the Vile Blood Queen. Clearly becoming a student of Gehrman where her use of skill over blood would be appreciated and nurtured was a major opportunity for Maria and no doubt was a preference she couldn’t refuse. her avoidance of blood usage must have been frowned upon in Cainhurst to some degree. Maria finally found a purpose in becoming a hunter, going out and slaying the beasts of the scourge while wielding her skill dependent weapon the Rakuyo. To me this is a clear cut connection between the two and it gives us comfort in the knowledge that we have truly given Lady Maria peace in death. The biggest difference between the two are their personalities which is why Gerhman has such a disdain for the doll, she is nothing like the woman he created her to be like, he had this curious mania, that for me borders on obsession. He clearly held Maria in high regard, I believe he was in love with the Lady Maria, all the evidence points towards that. There is a grave just outside the hunters workshop where in the real world we find the old hunters bone which grants us the old art of quickening, interestingly in the dream you can frequently find the doll kneeling in front of this grave. Could that bone have belonged to Maria? When we fight her she automatically uses quickening she doesn’t have to rely upon the use of a bone clearly indicating that she possesses the art of quickening. Another reason for me to believe that this is Maria’s grave is that it is our grave for the hunters nightmare, a place that Maria resides. This is an interesting theory to me, I really want to believe that the grave belongs to Maria, the fact that it is right next to the hunters workshop rather than with the rest of the 1000s of graves found in the hunters dream leads me to believe it use be Lady Maria’s as Gehrman would have wanted to have her grave close to him. So when working under Gehrman who worked alongside Willem Maria and the other hunters were given a task, a mission to retrieve an umbilical cord of a great one, willem longed for a way to communicate with a great one and an umbilical cord would grant him an audience with one . Byergynworth discovered that there was a deceased great one in the fishing hamlet, though this great one was pregnant meaning Willem could get the umbilical cord he longs for to ascend himself to a greater being. He sent the hunters including Maria to the fishing hamlet where they proceeded to butcher and murder the residents of the fishing hamlet as they searched for Kos and her umbilical cord. These residents were innocent people who didn’t deserve their ghastly fate. This is what I believe caused Maria to throw away her precious Rakuyo in disgust at what had just transpired in this small village. If this theory is true then that demonstrates the character of Lady Maria, a woman of morals and conscience who cares about what they had all just been a part off and she hates herself and all of them for it. She disposed of her beloved weapon down a well in the centre of the village, perhaps trying to throw away the blood on her hands with it. From here she made a decision to reside at the research hall, more specifically the astral clock tower, I think it would be fair to say that Maria committed suicide since you need to be deceased to be in the hunters nightmare. Judging by her choice to care for the patients in the research hall I think it demonstrates that Maria has got a somewhat caring side to her personality, to take on what happened in that hall and to feel the disgust at what I can only assume was a massacre in fishing hamlet demonstrates her compassion perfectly. Then again I’m sure she must have helped with he experiments performed by the healing church which could also explain her being near the research hall in the nightmare.After all a cold hearted unfeeling person wouldn’t be bothered by the actions she and the other hunters took in that village, in fact they would have relished in all the spilt blood they had caused and more than likely enjoyed the pain and suffering they had caused the quiet little village. When we first find Maria she is sat slumped in a chair just in front of the face of the clock, she looks like a corpse. You can see blood upon her clothing, to me it looked like an attempted suicide, but as a vile blood she would have the ‘undying’ trait that Annalise has. Though we can not be sure how she sided I imagine she killed herself to land herself in the hunters nightmare. However she couldn’t kill herself once again within the nightmare. I don’t know the reason for this but I would speculate that it is due to her ancestry, her relation to the immortal blood queen. Having said this I don’t understand how suicide would fail her in the nightmare if she succeeded when alive. But in the nightmare she has embraced blood blades so perhaps that is why she can’t bleed herself out, maybe there is some loose connection, she uses blood blades and it unleashes the true extent of what her blood can do. I would love to know what happened to Maria in the waking world for whatever it was I believe it to have been painful as Gehrman was distraught at her passing. It is a sad sight to see, when engaged in combat with her after learning about her lore you realise just how far the once great hunter has fallen. Maria is in a very dark place, almost certainly still haunted by her actions that fateful night in the fishing hamlet. Once upon a time she despised what she should hone, now however she embraces it. Gone is her dependence on purely skill, she still uses a Rakuyo though it is infused with her blood unlike her original Rakuyo which was purely a skill based weapon. To see that Maria has thrown away who she once was due to a horrific event is a sad act to witness but at least we can give her some peace through besting her in combat. 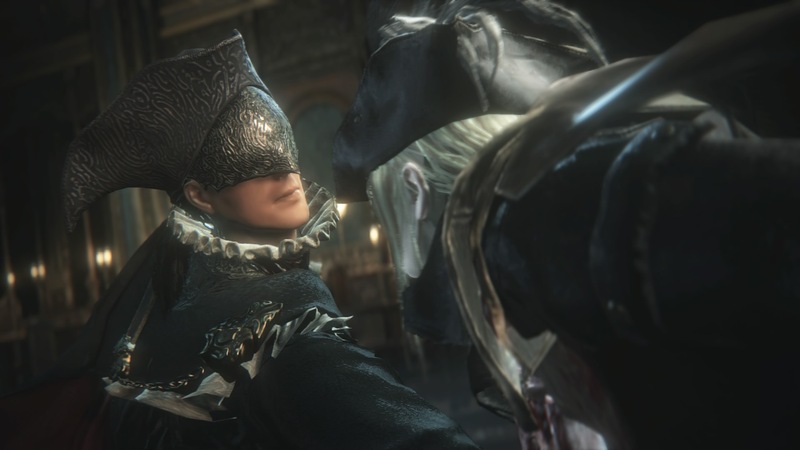 Now that we have talked about the background and lore to lady Maria I can give my thoughts on my favourite fight from the whole of Bloodborne, it was a true bout between hunters, like a dance it was mesmerising. Her fight consists of three phases, all are fairly similar with her reach increasing through the phases. The most interesting aspect of this fight is her second phase where she impales herself with her weapon thus imbuing it with blood, her blood. As we know she hated the use of blood blades so this shows just how far Maria has fallen since the events of the fishing hamlet. She is dangerous after utilising the blood and can build up blood damage very quickly with consecutive hits so the Cainhurst set is recommended for this fight. Then to throw an extra spanner in the works once she reaches phase three her attacks receive a flame buff so that means she is using both blood and fire in unison in her final phase. Her reach is also impressive by the third phase. Maria moves very quickly making incredible use of the art of quickening, honestly watching her movements throughout the fight was amazing, trying to counter her attacks by out moving her using her art of quickening is what makes this fight incredible. Of course we have faced other hunters before Maria but she was an original hunter, a hunter of amazing technique, she certainly grabs the prize for most impressive hunter we face and for me that does include Gehrman. I will explain what makes him slightly inferior in his own post, though I will stress that he is still an interesting character and a formidable foe. Now as with all hunter fights Maria is vulnerable to being parried so those of you who have mastered the art of parrying may wish to trivialise this fight if you can get the timings right. Due to her fast movements and quickening she isn’t the easiest of hunters to land a parry o but if you can you may save yourself quite a lot of hassle if you aren’t managing to keep up with this hunter. There is a nasty combo to look out for, if you find yourself caught up in it then you could find that the fight is over with this hunter from Cainhurst doing what she does best, killing her prey. For me personally I found that using a faster weapon was preferable to using a heavy handed weapon, she moves so quick that I found it easier using speed to counter it as opposed to slowly swinging a heavy hammer. The Chikage would be an ironic weapon to kill her with, imagine slaying a Vile Blood with their signature blood arts sword. The atmosphere surrounding this fight is immense, you just know that Maria is guarding something upon your first encounter with her. This sentence confused me upon first encountering Maria, I couldn’t decide if she meant that generally or had a certain corpse in mind. Of course upon completion of the DLC we discover she was referring to the great one known as Kos whose corpse is found in the fishing hamlet. The clock tower is very dark, with the only light illuminating through the face of the clock tower. This adds a gloomier feel to the fight, it’s not just the surroundings of this fight that are dark the essence of the fight itself is from a dark place. Maria is fighting to keep you from discovering what lies behind the astral clock tower, she is fighting to ensure you leave that village and its deceased great one alone. I almost felt bad for ridding Maria but we aren’t facing the hunter of legend we are facing the broken woman who never recovered from her actions no matter what she has done to try and redeem herself. Lady Maria is a true example of a boss done right, from her amazing lore to her stunning boss fight. I hope you all enjoyed reading this, I will be back soon with another instalment in the SoulsBorne boss series. If there is a boss you would prefer to read about please let me know. Thank you for reading. Top 5 Bloodborne boss fight for me, without a question. For the lore, for the mechanics, for the aesthetics, everything (providing you don’t parry cheese – I did once and it felt quite frankly awful). I’ve done the fight with a few weapons but some that stand out are the Chikage (it’s basically full anime at that point) and with the Hunter’s Axe (entirely two handed – that was a fun challenge). Great write up. One thing I will say is in regards to Maria’s corpse line of dialogue,I think it’s on one of Vaati’s video’s (maybe, I am speaking from memory here) the original Japanese line can be translated as something along the lines of “you shouldn’t fish about a corpse” which pretty much sets up the Hamlet. I.e If you go fishing you might find something. Great write up you’ve done here. Excellent work. I know this is old, but I love anything that has to do with Lady Maria. This is my favorite boss and npc in all of Soulsborne, and I have played every game at least three times. Her lore, her design, the way she moves and the amazing music all make me love this boss. She isn’t the hardest boss, but that’s not why I play this series. Her story is heartbreaking, yet beautiful, and her animations are deliberate, but fast movements designed to catch her opponent off guard. Her music fits the fight perfectly. Starting slow and subtle, then ramping up as she changes phases, rising to an epic climax while the player is dodging visually amazing flashes of blood and fire. I also think that the metallic clicks of her weapon as she transforms it and prepares attacks fit well with the music. It is sad that she can be so easily cheesed with parries. As soon as I saw that, I unequipped my gun and dueled her with the Blades of Mercy. That made it a challenging duel with a worthy opponent. I was sad when I beat her since I wish I could duel her forever.